Abt Sportsline is the famous German auto tuning company based in Kempten but also it is a well-known and successful racing team. The first company owned by Abt family was founded in 1896 and was involved in the motorsport since the 1950s, but the Abt Sportsline was founded in 1991 by Christian and Hans-Jurgen Abt, and since the beginning, it was involved in the world of motorsports. Christian was a pretty good driver and in 1991 he was Formula Junior champion. Next year, he won Formula 3 title while in 1999 he became the Super Touring Car Cup champion. Abt Sportsline mainly worked with Audi, but also with Volkswagen Group’s brands Skoda, SEAT, and Volkswagen, as well with Bentley, and achieved numerous wins and won many trophies in the various racing series. In 2000, when the private team entered the competition with four modified Audi TT-R cars, Abt Sportsline became involved in popular DTM series. In 2002, Laurent Aiello won the first DTM title for Abt Sportsline while the team finished 2nd in the championship. Two years later, Mattias Ekstrom became a champion driving Audi A4 DTM while the team won its first crown. After that success, Abt Sportsline became one of Audi’s official factory teams. Over the years Abt Sportsline has always been one of the leading DTM teams and the next trophy was won in 2007 when both Ekstrom and the team became the champions again. 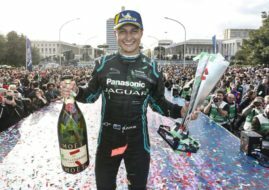 That was the beginning of the supremacy in the Drivers’ championship that lasted for two years after Timo Scheider won two consecutive titles in 2008 and 2009. The next Teams’ Championship trophy in DTM was won in 2011 when the drivers were Mattias Ekstrom and Mike Rockenfeller while another title was won in 2016 when the drivers were Edoardo Mortara and Mattias Ekstrom. DTM has always been Abt Sportsline’s priority, but the team was active and successful in other racing series too, especially in ADAC GT Masters. In 2009, his last year before retiring from active racing, Christian Abt became a champion driving an Audi R8 while the team finished 2nd in the standings. Next year, Abt Sportsline won the Teams’ championship title thanks to the excellent driving of Christopher Mies and Luca Ludwig. Another Teams’ title in ADAC GT Masters was won in 2013 when Abt Sportsline was running three Audi R8 LMS Ultra’s while in 2014 the team won both trophies. Rene Rast and Kelvin van der Linde were the best in the Drivers’ championship, driving the same car they used in 2013. In 2016, Abt Sportsline parted ways with Audi in ADAC GT Masters and the team started to run Bentley Continental GT3. When Christian Abt retired from active racing, his successor was Daniel Abt, the son of a managing director Hans-Jurgen. In 2009, Christian won the title in ADAC Formula Masters and that year was probably the best in the team’s history. In 2010, the kid proved that he is talented, by finishing as a runner-up in German Formula 3 Championship. Daniel also continued to drive for Abt Sportsline in ADAC GT Masters. In 2014, Abt Sportsline, in cooperation with Audi, became involved in the latest competition under the FIA’s umbrella. Formula E was a big challenge for the team but still it seemed like everything was going pretty well. Daniel Abt was teamed with the Brazilian Lucas di Grassi to form the pair of drivers and the team finished 3rd overall in the first season, while di Grassi was 3rd in the Drivers’ championship. During next season, the team progressed to the 2nd place in Formula E championship while di Grassi was also a runner-up, losing the title in the last race by only two points. For 2016-2017 Formula E season, Abt Sportsline will try to make progress with its partners Audi and Schaeffler, and the same pair of drivers but with the modified powertrain. Since 2014, ABT Sportsline has been taking care of the cars fielded by quattro GmbH in the Audi Sport TT Cup that is held as a part of the DTM’s supporting programme. Abt Sportsline has its branches in more than 60 countries on five continents and provides a unique customer service, so it is rightfully considered as one of the largest tuning companies in the world.